Gantt charts are visual representations of tasks, time lines and task relationships based on information that's been entered into the system for a project as progress on the project occurs. In the example above, Test Case Problem is a Summary Task, symbolized by the bold text of its description and by the solid line extending to the right of it and above the group of tasks below it. The four tasks below Test Case Problem are indented and appear in regular text, without the bold treatment, to show that they are tasks within Test Case Problem . They're represented by a wider horizontal line with a shaded color as shown below. In the example above, the shaded bar for the task called Document in tracking system within the Test Case Problem summary task also displays a solid line from the left side to the halfway point. This line is a percent-complete indicator showing that a Percent Complete of 50% has been entered for the task and that the team has completed two and one-half days of work for this five day task. Each of the tasks in the example Gantt chart is connected to another task with an arrow. The direction and placement of the arrows indicates that they have a relationship defining when each should begin or finish relative to the other. The task on the upper left above must complete before the task on the lower right can begin, indicated by the arrow used for a Finish-to-Start relationship. See the descriptions of relationship Types in Add Task - Predecessors. In the final task belonging to Test Case Problem, there's a milestone symbol for Test case problem complete: . 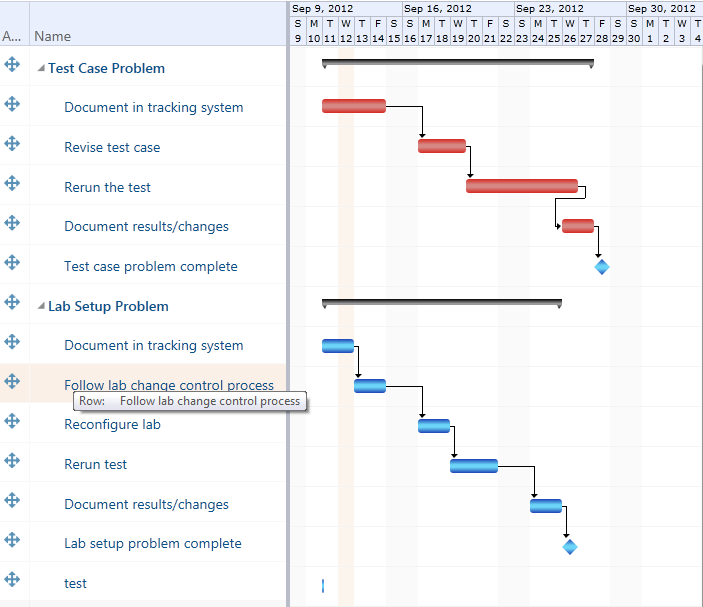 The second set of tasks in this example Gantt chart -- those belonging to Lab Setup Problem -- appear red in color, indicating that they're part of a Critical Path task. Any change to a critical path task will result in a change to the scheduled end date. Critical path is displayed by the system based on dependency calculations within the schedule. The information that displays in your Gantt charts are under your control. To add columns, click the Page Display Options and the new columns will appear as below. 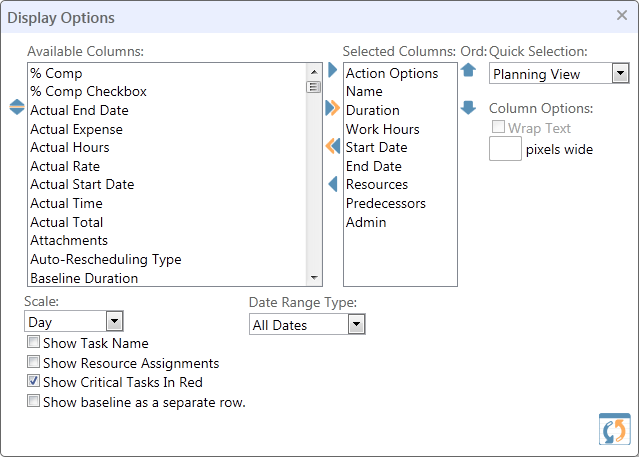 Data columns for display may be moved in and out of the Selected Columns from the Available Columns. Data in the Selected Columns will display when you click Update Display in the lower left of this selector box following any modification to the Selected Columns, Quick Selection (column display option templates set by the administrator), Column Options, Start Date, End Date, Scale and/or Full Screen Display. More detailed instructions for displaying the data columns in the Gantt chart can be found in the Page Display Options section of the online help.